Research and evaluation are recognised as essential aspects in improving Aboriginal and Torres Strait Islander health policy and practice. Evaluation has the potential to benefit Aboriginal and Torres Strait Islander people and communities both through improved policy and programs. Evaluation can also provide opportunities to harness and develop community expertise. However, there is concern from community, evaluators and government that the evaluation of programs addressing Aboriginal and Torres Strait Islander health and wellbeing do not always deliver these benefits. Questions have been raised about the utility, effectiveness and ethics of the research and evaluation undertaken in Aboriginal and Torres Strait Islander health, leading to reconsideration of the purpose of health program evaluation in this area. This project aimed to develop a framework to guide future evaluation of health policies, programs and services for Aboriginal and Torres Strait Islander peoples across Australia. The development of the framework was oriented towards improving the benefits of evaluation for Aboriginal and Torres Strait Islander people. The process focused on identifying the essential elements of evaluation planning and practice, and highlighting the requirements needed to undertake evaluations in this area. The project was conducted from September 2016 to December 2017. The project identified barriers that prevent the evaluation of programs to address health and wellbeing among Aboriginal and Torres Strait Islander people from optimally benefitting those communities. It also identified promising initiatives and exemplars that suggest ways to improve practice. 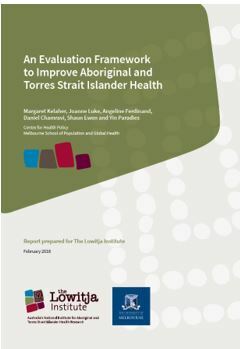 This project makes the following recommendations for an evaluation framework to improve Aboriginal and Torres Strait Islander health and to ensure tangible benefits from the policies, practices and services designed to improve the health of Aboriginal and Torres Strait Islander communities. Transparency and accountability around Aboriginal and Torres Strait Islander health evaluations should be improved by ensuring access to tender documents, evaluation reports and documentation of responses to evaluations. Evaluations of programs addressing Aboriginal and Torres Strait Islander health and wellbeing should use the framework to address government principles for working with Aboriginal and Torres Strait Islander people. Evaluations of programs addressing Aboriginal and Torres Strait Islander health and wellbeing should use ethical frameworks that recognise the responsibilities of all parties in evaluation and make optimal use of their capabilities to deliver health benefit.